Today’s guest is a New York based confidence coach and author. She’s been featured everywhere (really) and figured out how to get all that media attention without a degree or a PR machine behind her. She teaches others how to pitch and “guest post” at outlets that will get you noticed! She’s on a mission to help all of us be more confident in life so we can be more visible. It’s time to be seen and heard more fully and Susie Moore is here to share how she’s done this for herself and how she can help of us do it as well. Hear how Susie’s lack of formal education didn’t stop her. She had an impressive corporate career before she started her side-hustle. She’s a self-described former blazer wearing, business card carrying corporate executive. Susie breaks down why she decided to start her side-hustle (now full time) and why getting free media was her only strategy in the beginning. Find out why going after big media outlets is a better option, and the simple strategy Susie used. She also shares her mind-set that enabled her to go for it (front row style) and the 2 key questions to ask yourself. Hear why starting small isn’t the best strategy. It’s so simple, you’ll wonder why this didn’t think of this yourself. Susie didn’t hold back with the how-to details. She shares the 4 key steps to getting incredible (free) media coverage and how to leverage it so it doesn’t just make you famous but translates into business. She also shares how to pitch, along with who to contact and where. While she admits that almost anything will work if you throw enough pitches out there, she explains how she does for herself and how you can do the same thing. It’s not as hard or as time-consuming as you think. Bonus: This one strategy has yielded incredible results for Susie’s clients and she shares real-life examples. Mind-blowing simplicity, with incredible results here. Be prepared to take notes as she outlines how you can take evergreen content (your best stuff) and match it up with a hot-in-the news-story going on right now. This will position you as a sought-after expert and give you a huge boost in visibility. Plus, she’s the queen of repurposing content! She shares 6 specific things you can do today with content you’ve already created! No need to spend energy on new content when you have articles and posts or videos ready and waiting to be highlighted again. This is genius and something you’ll want to do today! What is essential? How can it be easier? Jen and Susie issue a challenge! You’ve got to hear how easy this will be and get Jen and Susie sharing your success and cheering you on. You’ll need their Twitter info for this so here you go. No excuses not to do this! Susie shares a bit of her personal story (it’s touching and uplifting) from her teen years and a big reason she has confidence to be the visible, happy, successful person she is now. Acknowledging you deserve and want more confidence is a key step one. She explains step 2 and 3 as well and tells us about the book that literally changed her life overnight. A quote from the book “Always be a front seater” How perfect is that? The permission slip is there, you really can do anything you want. Use Susie’s method for not letting negative thoughts get traction. Confidence is a learned skill. Which means everyone can learn it and everyone can be confident. Susie is helping people do that for themselves. Confidence is there inside you, it’s just about recognizing it and bringing it out in yourself. We couldn’t resist: The Real Housewives dish! 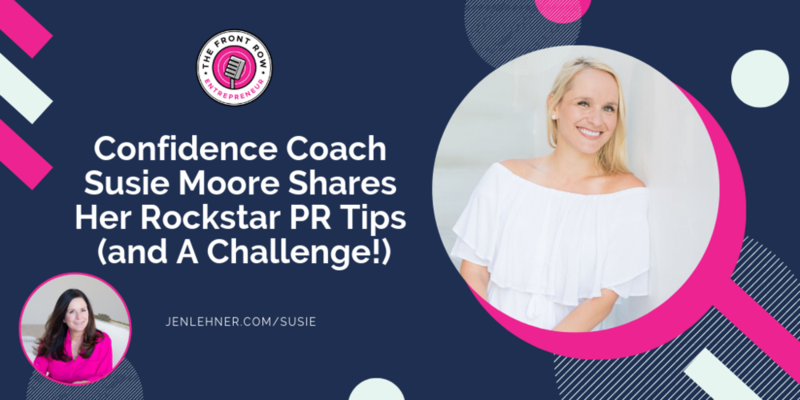 Get Rockstar PR – free course! The Magic of Thinking Big by David J. Schwartz PH.D.
Susie Moore is a high-performance coach and advisor to high-growth startups in Silicon Valley and New York City. Her first book “What if it DOES Work Out?” debuted as a #1 Amazon bestseller in Women & Business. In it, Susie shares secrets to transform your passion into cash, honed from her successful career as a Fortune 500 Sales Director. She has also helped build three startups, all of which were sold – the most recent of which for $405 million. Susie has been featured on the Today show, Oprah.com, Business Insider, The Huffington Post, Forbes, Time Inc., MindBodyGreen, and is the resident Life Coach and Columist for Greatist. Susie’s insights have been shared by thought leaders including Arianna Huffington, Paulo Coelho and SPANX Founder, Sara Blakely. When she’s not working, Susie can be found exploring New York City, planning her travels (next up: an extended stint in Portugal!) brewing the perfect cup of English Breakfast tea, and spending time with her husband Heath and their tiny (not very bright but certainly very lovable) dog, Coco.